Hi! Thanks for stopping by my site. My name is Evelyn Glinski and I first started breeding dogs in 1974. I started with a beautiful Golden Retriever puppy. It was merely fate that I met my mentor for confirmation, but I never looked back. I bred goldens and had the good fortune of meeting some excellent breeders that taught me valuable lessons. In confirmation, my breeding was chosen over well known breeders of that time. Canadian judges appreciated my line and I titled my male with a Canadian Championship. In obedience training, I titled several dogs, some of which were not of my breeding, but that I trained and handled. However, as I continued, my life got in the way of my dog aspirations. In 1994, I fostered two lost German Shorthairs found on a snowmobile trail: a mother with a seven month old pup. So cold, weak, and thin the mother was still letting the pup suckle. I never had contact with this breed before this but it was a real treat. At this point, I had all but given up dreams of dog showing, but with these two shorthairs, I began to entertain probable possibilities again. After extensive research I found and purchased an extraordinary female German Shorthair, once again moving forward never looking back. Sidetracked with life, years had gone by but I had finally found some time in my schedule to show again. 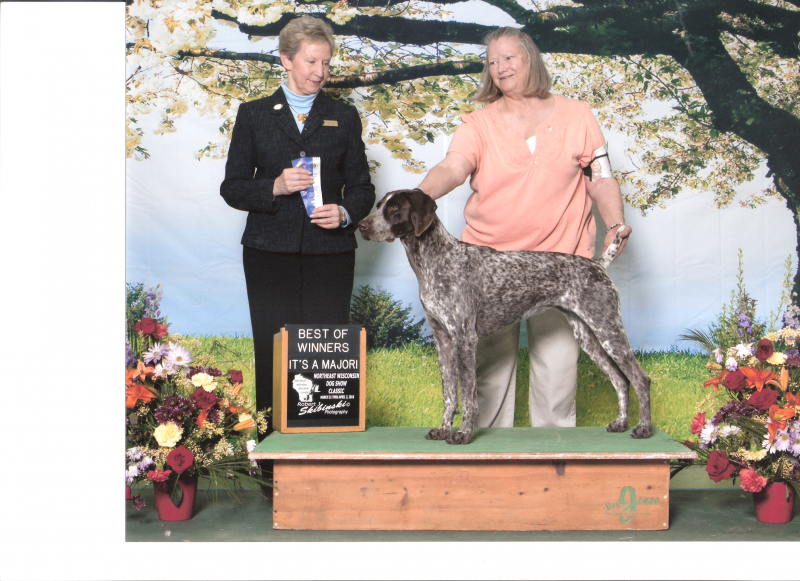 I have now titled 3 German Shorthairs to AKC/UKC Championship titles. I only have a litter every 4-plus years. My goal in breeding is to improve the GSP standard, create healthy offspring, and maintain an appealing temperament: energetic, mental alertness, physical stamina, and that loving “want to please” personality. 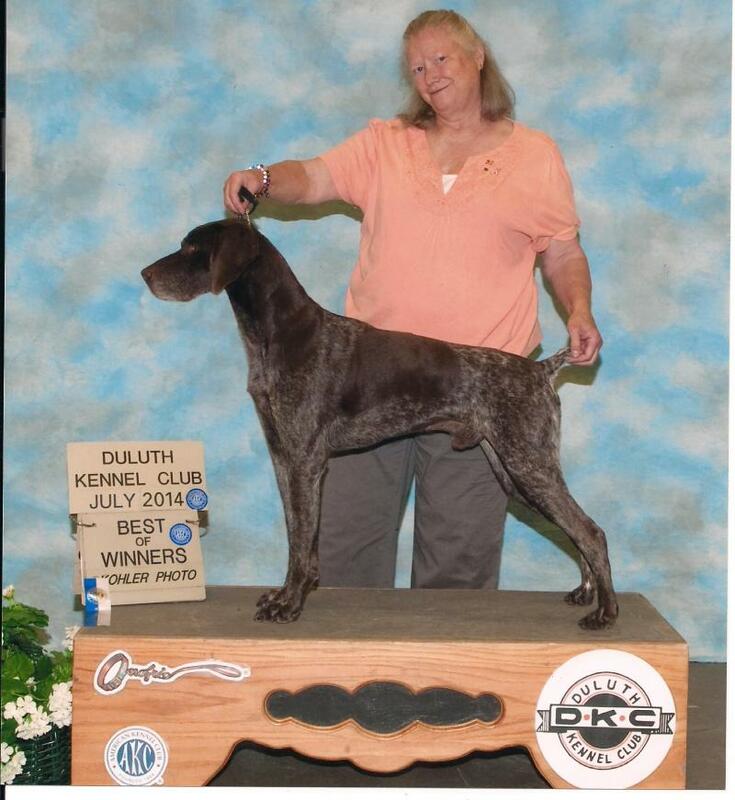 This is Spike at six years old finishing in Duluth as Best of Winners for a Major.